Get your shopping organised before you hit the store with this Big Shop shopping list note pad. You can list what you need in the different sections to make it simpler and quicker to do your grocery shopping, whether you're in the store or online. 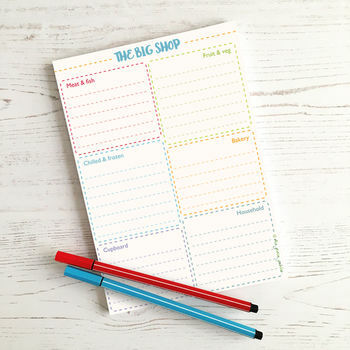 The shopping list note pad is A5 in size and the design is printed on all 50 pages in the note pad. The pages are printed on 100% recycled 90gsm paper with a recycled back board in the UK. The shopping list note pad is printed on 100% recycled paper. The pad measures approx 21cm high x 15cm wide.